John Burke has visited 79 countries as a travel writer and photographer. He has attended World Travel Market since 1985, and also reported from ITB in Berlin and Resalivet in Oslo. He took the pictures as well. 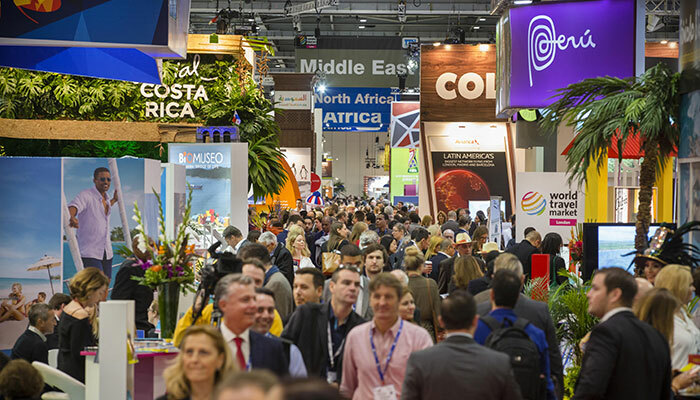 The 37th World Travel Market in London took place last week in a more subdued atmosphere than usual. This was nothing to do with reducing the show from four to three days, as the total time was upped from 30 to 32 hours. Unlike in previous years, there was no gala opening by such celebrities as Queen Rania of Jordan, and no sign of the mayor of London or Britain’s nearest equivalent of a tourism minister, Karen Bradley MP. Instead, the opening day saw a Mintel seminar on the likely impact – incoming and outgoing – of Britain’s quitting the European Union which, incidentally, may not have sponsored as many national stands as in the past. Fewer press conferences suggested fewer than the usual 100 ministers and board chiefs visited WTM, and the traditional banquet for them has been abandoned. Greece hosted the press centre once again but did not bother with a press conference. Israel took the award for the biggest shambles of the show, the once very-effective media gathering abandoned with their PR consultant issuing a statement after the event to say the stand hosted at some point the minister of tourism, Yariv Levin, with Israeli ambassador to the UK Mark Regev in attendance. The release actually contained some interesting news, once you searched, but readers will have to wait until next week for that to be divulged. To cap it all, the UK director of tourism did not attend, said to be in Israel. But the biggest dampener was geopolitics, which led the show’s organiser, Simon Press, to admit that tourism “faces many hurdles”. This was confirmed in the annual survey commissioned from Euromonitor, which estimated more than 1.2bn international arrivals this year, with a surge to Africa, but avoided further predictions. The spread of strife was the reason WTM upgraded last year’s packed workshop, led by four security experts, to a nervous ministerial summit on travel risks, with representatives from 14 countries such as Turkey, Egypt and Tunisia. Also consulted were Nina Brooks of Airports Council International and Mark Tanzer from the Association of British Travel Agents. Taleb Rifai from the United Nations World Tourism Organisation held a conference about the Middle East and North Africa. It was also significant that the usual ethical panels were joined by one on “resilience, because destinations and tourism businesses have been hard hit by terrorism, extreme weather, strikes, civil disorder and health scares”. Otherwise, the standard subjects ranged from human rights, environment and responsibility to wildlife, women and wellness – no fewer than ten panellists at this one. The impact of Islamic tourism was also on the agenda, whose most bizarre lecture was entitled “How tourism can help the refugee crisis”. Last year’s disastrous workshop on whether national tourist offices were obsolete was changed to one about “misconceptions”, but hardly anyone attended. Cruises did not feature as a topic, although Louis Lines was among shipping exhibitors. Uzbekistan Airlines, a newcomer, helped to boost the aviation presence, as did the Chile stand, promoting direct flights from London to Santiago. Portugal was preparing for 6m pilgrims during a papal visit, but João Gomes of Fatima Hotels complained “all rooms have long been booked”. Opinion varied as to whether WTM was worthwhile, although an American on to a winner was Patricia Bickel, manning the stand of Trump Hotels, Las Vegas. Stephen Smith, of Tourism Trinidad, declared: “I have been super-busy at meetings all day” but an exhibitor from Bergen said the show was not cost-effective. The Philippines’ tourism secretary, Wanda Corazon Teo, told me: “WTM is important to us, as Britain is our biggest market, with a 13% increase this year”. Michelle Ulyatt of DFDS Ferries said she was making useful contacts, a comment echoed by Rafael Abreu of Statue Cruises, New York, but an exhibitor from Brussels admitted that business was bad. Bolivia was at WTM, but not Ecuador this year. Kyrgisztan promoted the ancient Silk Road, and Mongolia tours across the Gobi Desert. Other emerging destinations included Iran. Ukraine, Russia and China had official stands, but not the three Baltic states. There was the usual presence of about 100 firms in travel technology, which featured in several seminars, including one on aids to travellers’ security. As to bookings, Euromonitor stated that mobiles now accounted for 18% of sales on line. Finally, it is not clear if WTM got as many as the 3,000 journalists it always claims, but old hands were annoyed at the press centre’s removal from a private area away from the noise to one in the southern exhibiton hall. It took up a lot of space. Make your own mind up for the reasons and it may have worked very well, except the media were not told of the move. A small sign outside the traditional venue is not good enough.